Growth in the eight-industry core sector crawled to rise just above 2 per cent in February from 1.5 per cent in the previous month, which along with moderate retail price inflation may prompt the Reserve Bank of India to cut the policy rate on Thursday. The growth stood at 2.1 per cent in February against 5.4 per cent in the same month a year ago. 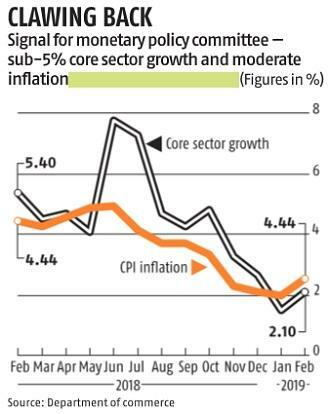 With consumer price index- (CPI-) based inflation rate at just 2.5 per cent in February, economists expect MPC to go for 25 basis points at its first annual policy statement for 2019-20. “Under the current growth inflation dynamics, some room is available for the RBI to go for a 25 bps cut in the policy rate,” Sunil Kumar Sinha, principal economist, India Ratings, said. He said he further expected the policy stance of the RBI to change from neutral to accommodative. The data will have impact on the index of industrial production (IIP) as 40 per cent of the index is accounted for by the core sector. 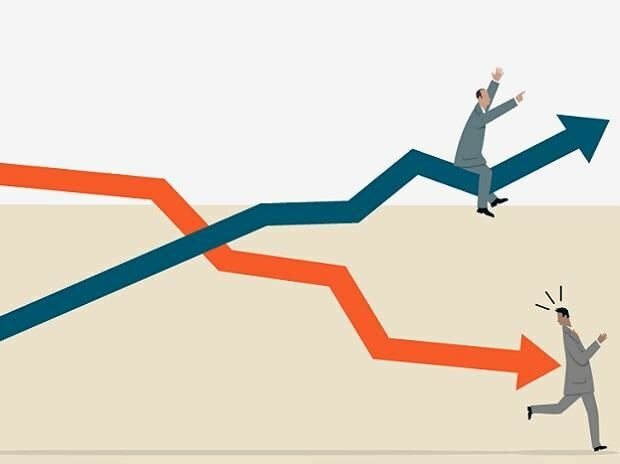 Terming core sector growth as disappointing, Madan Sabnavis, chief economist at CARE Ratings, pegged IIP growth at 2 per cent for February against 1.7 per cent in the previous month. This is the fourth month in a row that the expansion in core sector activities rose below 4 per cent and seventh consecutive month to witness sub-5 per cent growth. Even as the overall core sector growth rose higher in February than in the previous month, it was attributable to expansion in coal production and declining pace of contraction in the refined products. Coal production grew 7.3 per cent in February against 1.7 per cent in the previous month. “Higher coal production is a good sign,” Sabnavis said. Crude oil and refinery products continued to contract in February. There was not even a single month in the current financial year that crude oil production did not contract. Refinery production also fell for the third month in a row in February. However, the rate of decline fell to 2.4 per cent in February from 8.1 per cent in the previous month. Elsewhere, every industry showed a fall in production growth, be it natural gas, fertilisers, steel, cement and electricity. “Quite clearly in the infra space there is limited activity, which is being spearheaded by the government, especially roads, railways and urban development. Private sector involvement remains fragile as of now,” Sabnavis said.